The Iowa Labor Collection and Iowa Labor History Oral Project, State Historical Society of Iowa was unanimously selected as the 2018 winner of the John Sessions Memorial Award. The Iowa Labor Collection, housed in the Special Collections department of the State Historical Society of Iowa (SHSI) in Iowa City, currently consists of more than 1,200 oral history interviews collected via the Iowa Labor History Oral Project (ILHOP) and 1,500 linear feet of labor documents, images, and artifacts. The carefully stewarded collection has spawned several public history displays, served as the basis for scores of scholarly articles, dissertations, and monographs, and sustained a high level of engagement in labor history among Iowa labor leaders across multiple generations. 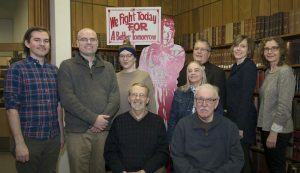 Shortly after the Iowa Labor History Oral Project (ILHOP) was initiated in 1974 by the Iowa Federation of Labor (IFL), the project forged a lasting partnership with the State Historical Society of Iowa. Through the late 1970s and 1980s, the IFL funded the collection of professionally conducted oral history interviews and worked with SHSI Collections Coordinator Mary Bennett to ensure preservation of materials recovered by the project which, taken together, now form the Iowa Labor Collection. Over decades, Bennett has facilitated accessions of union-donated materials to create a now extensive archive of labor union records, newsletters, newspapers, and other printed material to complement the oral history interviews. In the late 1990s, Bennett coordinated SHSI’s work with the labor movement to secure federal funding to process, catalog, and index the oral history interviews—making it possible to identify individual interviews by name, union, town, employer, industry, race, or gender, and to search the collection for references to important themes, subjects, and important historical events. The resulting collection covers all industrial cities in the state and many smaller communities, particularly near coal mining regions. Most recently, Bennett assisted in curating interviews and artifacts from the collection for “Speaking of Work,” a 2017 exhibit that reached over 35,000 visitors while featured in the University of Iowa’s Mobile Museum. The Iowa Labor Collection is widely regarded as one of the most comprehensive labor history collections in the world, and ILHOP is one of the only large-scale oral history projects initiated and funded by labor unions themselves. ILHOP and the Iowa Labor Collection represent an enduring partnership between Iowa labor unions and the State Historical Society. While the Iowa Federation of Labor remains the project’s primary institutional partner, dozens of individual unions maintain close relationships to ILHOP and the Labor Collection. The resulting archives have garnered international recognition as a unique example of successful long-term collaboration among librarians, academics, and the labor community. The John Sessions Memorial Award, sponsored by the Department for Professional Employees, AFL-CIO, consists of a plaque and recognizes a library or library system which has made a significant effort to work with the labor community and by doing so has brought recognition to the history and contribution of the labor movement to the development of the United States. The award will be presented at RUSA’s President’s Program, featuring Dr. Carla Hayden, Librarian of Congress, on Saturday, June 23 at ALA’s Annual Conference in New Orleans. Additionally, on July 18, RUSA will host a free, moderated webinar to feature a Q&A with the winners to learn of their outstanding legacies and contributions to librarianship. Kelly S. Janousek and Yan Liu.